This past week was the Jewish holiday of Yom Kippur, also known as the Day of Atonement where you fast and pray in synagogue all day and atone for all your sins over the past year. Our rabbi delivered a powerful sermon that took a page from David Brooks' "The Road to Character", emphasizing the importance of "eulogy virtues" (e.g., character) as compared to "resume virtues" (e.g., competence). Rabbis have the opportunity to go to a lot of funerals where they deliver – and listen to – many, many eulogies and so his message was particularly poignant. One of those eulogy virtues that he emphasized was that of humility, defined by Dictionary.com as: "having a modest opinion of one's own importance or rank". There is great power in humility, something I have observed in many entrepreneurial leaders. In fact, I find that the entrepreneurs I enjoy working with the most are those that are authentically humble. The day before Yom Kippur, I had two board meetings with two of my most humble CEOs. Both are running startups that are growing, profitable and on a track to make their investors and employees a lot of money. Neither thumped their chest in the board meetings. Just the opposite. Here is how many of their sentences started: "It took me too long to figure this out, but…" or "I'm struggling with the issue of how to…". Rather than cover up mistakes or weaknesses, the humble leader draws attention to them and rallies the group to problem solve together. Sometimes executives who lack a deep self confidence try to over-compensate with bravado and promotion. As I get older, I find I have less tolerance for this style of operation. That's not to say that there aren't plenty of amazingly successful leaders who are pretentious and overbearing. But for my money, I'll take the humble leader any day. Yes, they need to be exceedingly competent and skilled, but when they can blend competence with character and humility, it is a potent combination. Jim Collins describes this potent combination in his famous book, Good to Great. 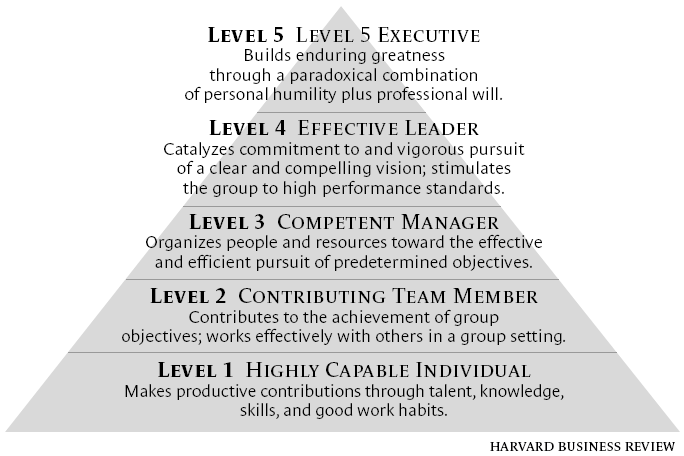 Collins frames the five levels of leadership (see pyramid above), which culminate in "Level 5 Leaders" who are humble but have a huge amount of will to succeed. Thinking about this style of leadership reminds me of a famous speech by General Norman Schwartzkopf, delivered to the graduating class at West Point. I was introduced to this speech by HBS leadership professor Scott Snook (himself a West Point grad). Start at minute 3:08, where Schwartkopf declares: "To be a 21st century leader, you must have two things: competence and character." Schwartkopf could deliver the Yom Kippur speech at my synagogue any day.